On Friday evening, Hurricane Patricia is expected to make landfall in Mexico, and it's predicted to be a cataclysmic affair — it's currently a Category 5 hurricane, which means it has wind speeds of more than 157 miles per hour. And according to The Weather Channel, that's even selling it a little short, with wind speeds of more than 200 miles per hour making it the most severe hurricane ever recorded in the Pacific. 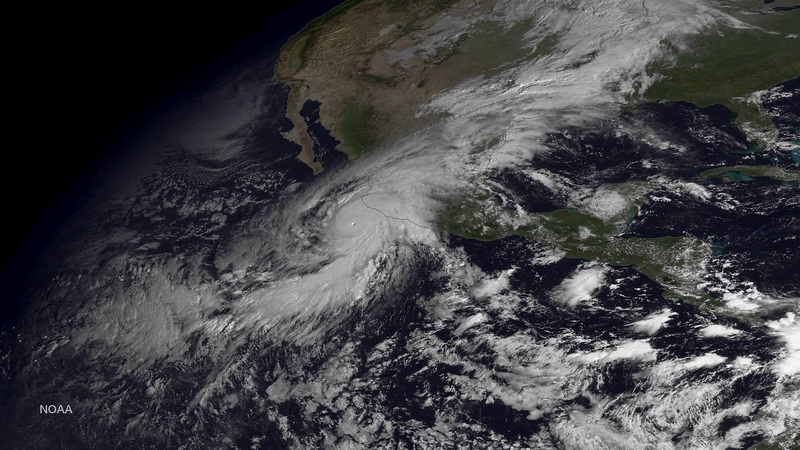 So, if you're wondering whether Hurricane Patricia will affect flight schedules, you better brace for some bad news. Suffice to say, Mexican authorities are expecting Patricia to be a hugely destructive event, and as such it's already wreaking havoc on air travel. According to the Los Angeles Times, airports in Puerto Vallarta and Manzanillo have been closed down altogether, meaning that tourists who were vacationing in the area won't be able to fly out until after the raging storm subsides. Both cities are squarely in the projected path of the hurricane, and they're expected to be hit hard. According to CNN, banks across multiple locations have also been shut down for the storm, and more than 1,780 shelters have been established. In other words, even if Patricia didn't cause significant weather changes, property damage, or loss of life stateside — it's projected to cut northeast across Mexico towards the southeast Texas border as it loses steam, where flooding is already a major problem — flights out of American airports are already being impacted. If you were looking to fly into either Manzanillo or Puerto Vallarta shortly, you'd best put those plans on hold, both for your own safety, and because you're not going to be able to get it. According to the Arizona Republic, both American Airlines and Southwest Airlines flights to Puerto Vallarta have been canceled, with travel waivers offered for rescheduling. As always, it's important to prioritize safety above all ease in situations like these. The worst of the storm will undoubtedly be felt by the people of Mexico, and it'll be important to keep an eye on conditions there in the days, weeks, and months to come, because there's going to be damage. Virtually everyone in the climate community is stressing the severity of Patricia — as the Washington Post detailed, National Hurricane Center spokesperson Dennis Feltgen spoke of it in no uncertain terms. Well, in a word, it's catastrophic. There's no other way to put it. It is a potentially catastrophic hurricane. There's no word yet on when the airports will be back open, but it surely won't be until after Patricia has run its course — it's projected to make landfall sometime between 6:00 p.m. and 10:00 p.m. ET, according to NBC News.